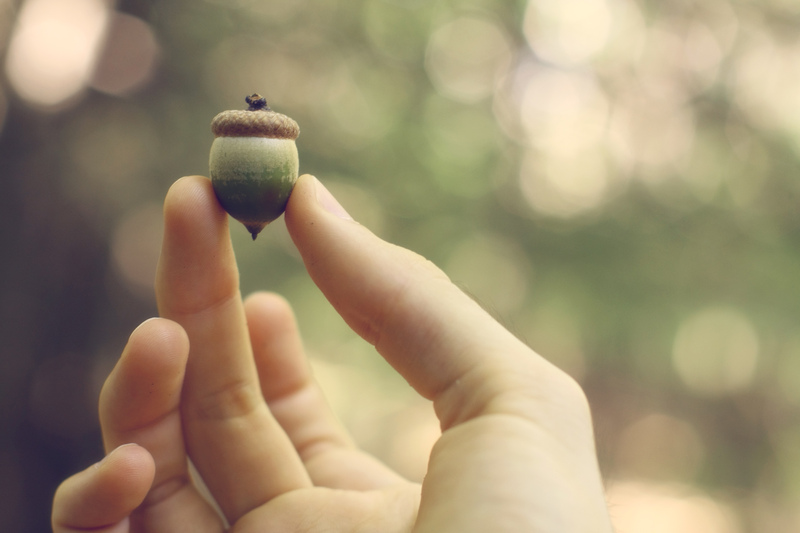 The seed of a troubleshooting tree is a desire to help someone else make it home in time for dinner. One thing I really hate is making the same mistake twice. In my tenure as a CTO, I always wanted to move forward, never making the same error again. I tried to clear the way for our team to make new mistakes. Some failures happen over and over again. As you gain experience with a machine, you’ll begin to see all the different ways it can break down. As discussed in “Same Symptom, Different Causes,” there will be times where a machine will appear to be broken like a previous time, but actually have a completely different underlying cause (and associated fix). Figuring this out can be costly, so let me introduce a way of preserving and communicating your hard-won troubleshooting knowledge: a troubleshooting tree. A troubleshooting tree for a train locomotive. Faulty fuel supply → Check → Overspeed trip; Clogged strainer or filter; Relief valves stuck; Shutdown valve. Uneven speed engine hunts → Check → Oil level in governor. Looking over this locomotive troubleshooting tree, you can see some symptoms have been identified as the result of a single cause (e.g., “Start contactors don’t close → Check → Interlocks”). Others, like the engine not starting, can have multiple causes, which need to be serially checked until the problem is remedied. 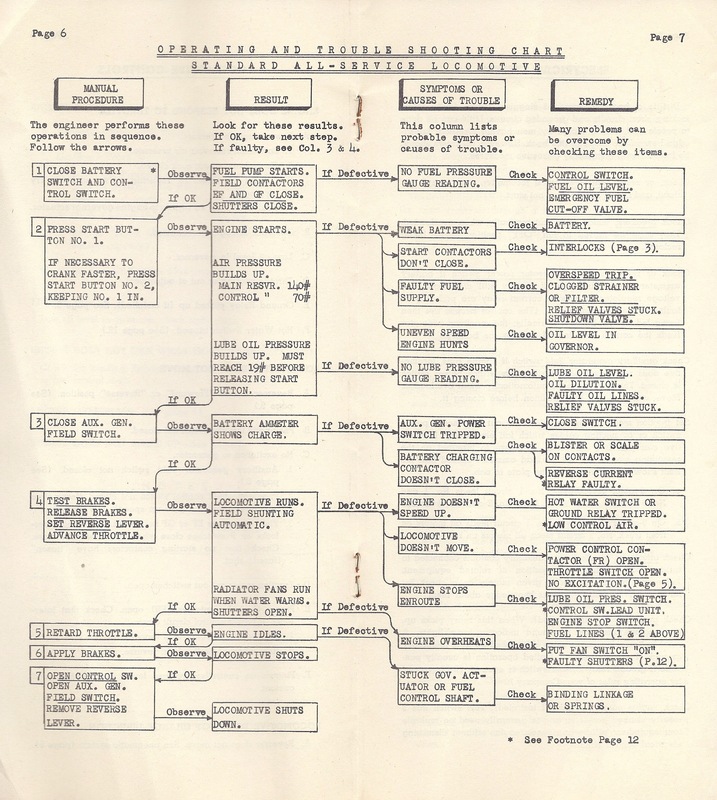 Some of the fixes in the tree are very quick (e.g., flipping a switch), while others refer to detailed procedures elsewhere in the guide that might take several pages to describe. For the operator, information like this is solid gold. The time savings from a guide like this can be immense: even just one branch on this tree might have taken days of trial and error to figure out! Necessary operating conditions, useful tools, easily missed assumptions, and setup requirements. The path of investigation, with all the likely possibilities for each decision node explained. In any kind of documentation you write, you must specify the conditions under which your methods are valid. Should a test be performed with a warm or cold engine? Is a certain software version required? Are there specific tools or resources that must be on hand to perform the operation as described? S-p-e-l-l it out, because if you don’t you can be sure that someone, somewhere will misunderstand what’s needed. Also, don’t count on “normal” conditions to exist. After all, the fact that the reader of your documentation is troubleshooting is a strong indication that the conditions present are not normal! Finally, when it comes to any kind of test, remember to include the full range of possibilities in your decision nodes (unless, of course, it violates the Laws of Physics or the possibility is otherwise covered in your prerequisites). If you’ve asked the troubleshooter to take a reading from a meter that reads from 0-100, you shouldn’t just list decision arrows for the ranges of “81-90” and “91-100”. What if the meter is reading “26”? 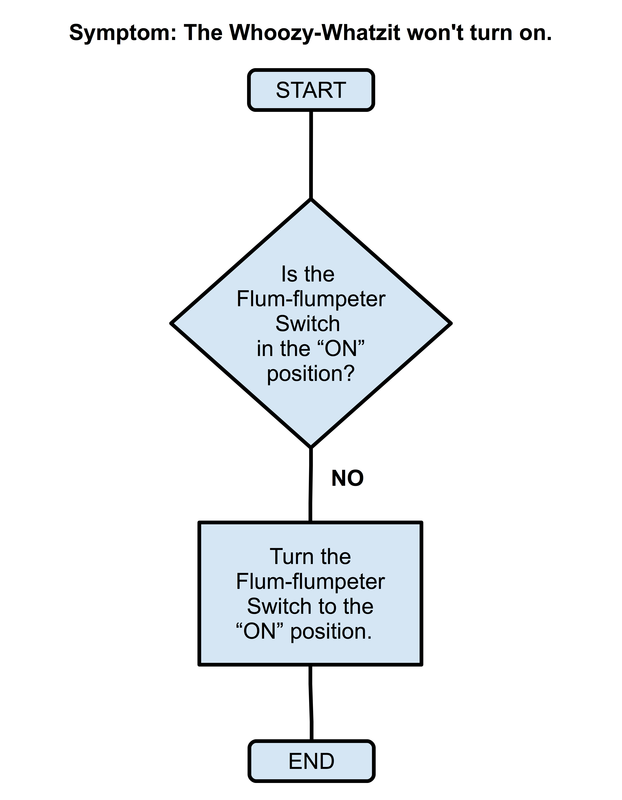 A basic troubleshooting tree with a single symptom, cause, and remedy. The “boxes and lines” layout is optional, you could represent the same information using words in a list. However, the visual structure of connected boxes makes it easier to understand and follow a particular troubleshooting path. When a new cause is discovered, expand your troubleshooting tree by adding a branch. Ideally, you’d have a recommended course of action for every possibility (i.e., for every “yes” branch there would be a “no” branch and vice-versa). 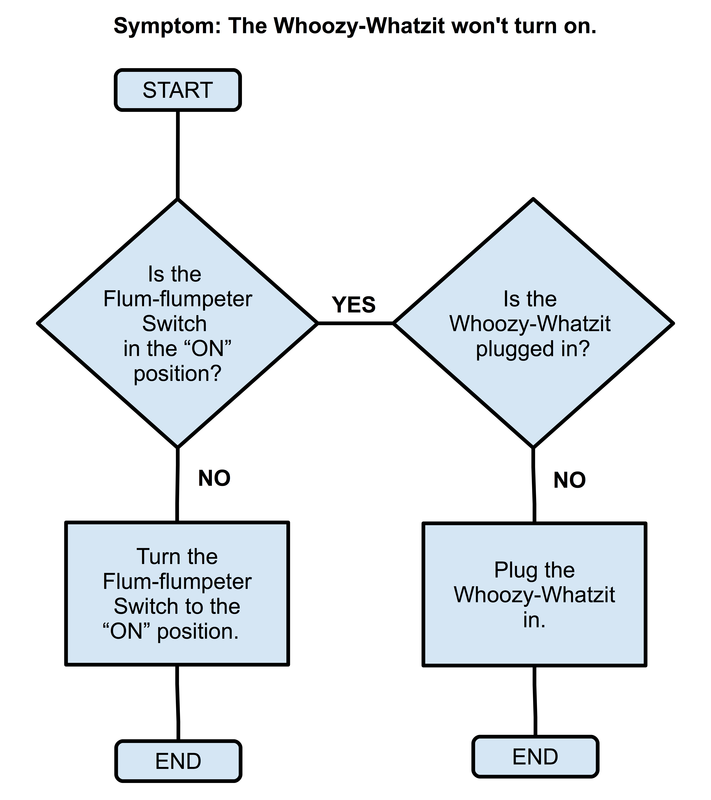 In this example, you can see that the reader is left hanging if the Flum-flumpeter Switch is “ON” and the Whoozy-Whatzit is in fact plugged in: there’s a missing branch for “yes” off the “Is the Whoozy-Whatzit plugged in?” decision node. What then? The probability of the failure is low (compared to other failures) or has never been observed. A desire to keep the documentation brief: maybe you only get a page or two for troubleshooting information in the back of a product manual and so you can only cover the most common failures types. The cost of researching a failure condition is prohibitive or would take too long. The information is geared towards a certain user group who are not likely to encounter the failure condition. For example, maybe you have a product that is installed in airplanes and boats and so you have a separate troubleshooting trees for mariners and aviators. If you are vigilant about updating it, over time a troubleshooting tree will represent the sum of all the knowledge you have for a particular set of symptoms and causes. Back to the point made at the beginning: always be moving forward with your troubleshooting knowledge. If you’ve already solved the problem and haven’t documented it, you’re blowing it! Creating and maintaining documentation is a necessary step for growing from “small” to “large.” Freeing information in this way allows an entire team to support your systems. Around Discovery Mining, we used to joke about our “bus number.” This is a morbid (and hilarious!) way to think about redundancy: how many people on your team could get plowed under by local public transit, and still life would go on? If the answer is nobody, you have a “bus number” of zero. Of course, people step away from their responsibilities for less dramatic reasons. They get sick, retire, receive a promotion, go on vacation, or leave to take a job somewhere else. Speaking of teams, documentation also allows you to introduce specialization by breaking your team into those that find the problems and those that fix them. Better yet, you can push your documentation all the way out to your customers and have them solve their own problems! Even if you’re troubleshooting alone with no team to support you, documentation like troubleshooting trees can be extremely useful. If you have to maintain a lot of systems, memorizing all the possible symptoms and remedies might be impossible. Also, documentation is a calming influence in a crisis. High-pressure situations favor the simplicity of following something like a troubleshooting tree, versus having to figure it out, again. Great to stumble upon your blog. Do you know of any software than can help me create a troubleshooting tree like the “A troubleshooting tree for a train locomotive” above? Hello, Chiat. I’m assuming you’re looking for a tool that can generate/update troubleshooting trees automatically? If so, I would check out the open-source graphing programs, especially something like Graphviz. If you look at their sample projects gallery, you can see all the different types of graphs you can generate programmatically. A troubleshooting tree should be well within its capabilities. Graphviz might be overkill for a one-off, but if you were maintaining a large set of documentation, being able to automate the creation of troubleshooting trees with something like it would be essential. Anyway, feel free to post here again if you discover something that works for you. I’m sure other people will be interested as well! Thanks a lot for the prompt response, Jason. I will check your references on Monday and get back to you.